I visited The Big Tree this week at Goose Island State Park during my trip to the Rockport area for the Hummer Celebration. 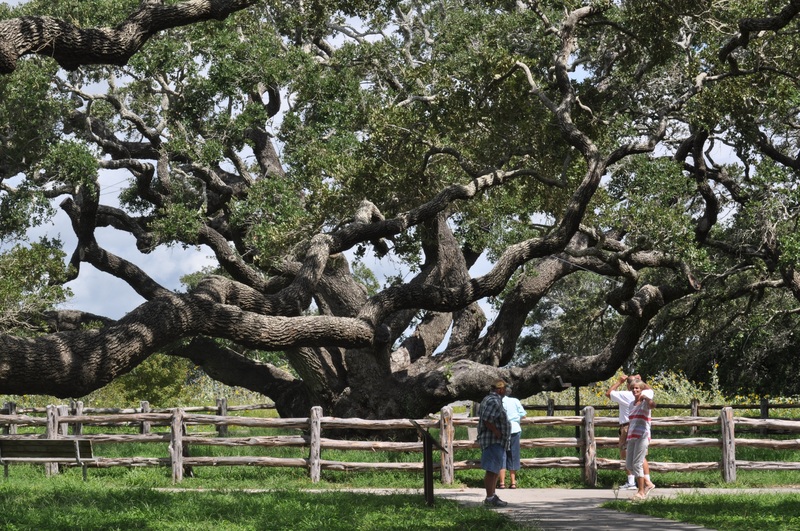 The Big Tree is a live oak over 1,000 years old and was named the Champion Live Oak Tree of Texas in 1969. There are smaller live oaks surrounding this venerable old tree, almost as beautiful. 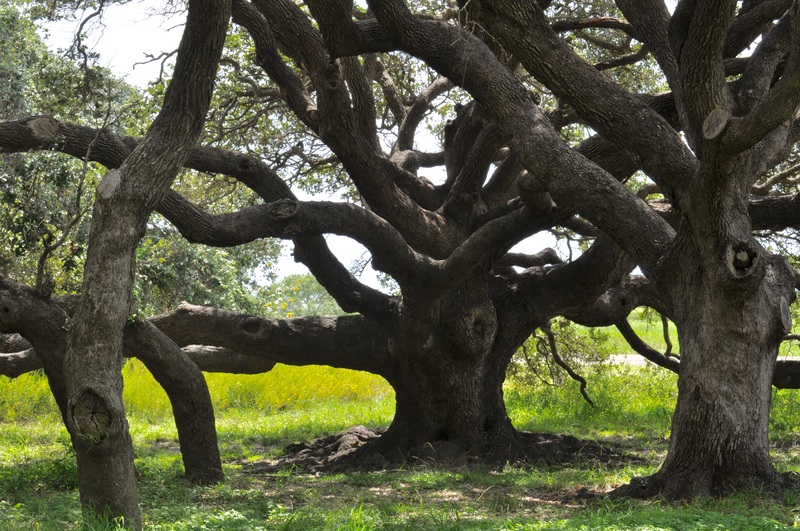 My friend, Susan a resident of Rockport, said “I love to come here to see this tree.” The age of it and the graceful, gnarly limbs pulled me, too, towards it. Maybe I thought of it as a survivor. A testament to standing in the face of adversity. Swaying softly in spring, rustling like applause in fall. Here in this peaceful part of my land. Golden sunlight diamonds have glinted on the ground around me. Cold fingers of ice have touched my heartwood. Dust-dry days of sandstorms have scoured my skin. And I have swayed, but stayed unbroken. Silver moonlight has kept me company many a night. There has been one thing I could not do. I could not grow green dollars, or silver, or gold. Will you help me, standing here before me? One of flesh, one of wood. One day the trees we have planted at The Raincatcher’s Garden of Midway Hills will also be as inspiring! Hummer Celebration Pictures from last year here. Take a look at Raincatcher’s Garden Trees. Posted in Trees and tagged Goose Island State Park, Rockport Hummer Bird Celebration, The Big Tree. Bookmark the permalink. Dallas County Master Gardeners growing and sharing from The Raincatcher's Garden.